Another complete edition on Hyperion reaches its close with this release: volume eleven of the songs of Robert Schumann. Having recorded all the great cycles in earlier installments, we're left with a selection that dates largely from the composer's problematic final years. 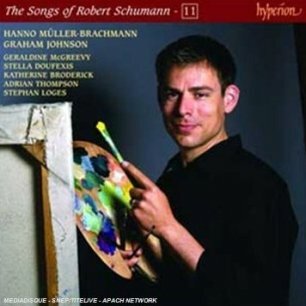 We do have a cycle of sorts from the annus mirabilis of 1840, but it is the obscure Sechs Gedichte aus dem Liederbuch eines Malers, hence Hanno Müller-Brachmann's faintly comic pose with brush and palette on the CD cover. In it Schumann sets poems by Robert Reinick, described diplomatically by Graham Johnson in his notes as a 'reasonably skilled versifier'. It's a shame that there's no great cycle to bring the series to a triumphant close but Johnson seems to be making the point that these later songs, traditionally ignored, do not necessarily show a composer whose inspiration is on the wane, as Schumann's popular biography suggests. Nonetheless, there's nothing hagiographic about Johnson's approach and while he acknowledges weaknesses he argues that this is more due to an heroic if ultimately unsuccessful attempt by Schumann to reconcile his own musical language with the advances made by Wagner and to posit a valid alternative; the two had, Johnson reminds us, both briefly lived in Dresden before Wagner's revolutionary activities had forced him to flee in 1849. In addition we are given reasons for seemingly ill-advised choices of text. Schumann likely set the the poetry Wilfried von der Neun (aka Wilhelm Schöpf) due to sympathy with the poet's political stance; earlier he chose to set Robert Reinick because the picturesque, romanticised view of Germany in his verses might have helped the composer curry favour as a patriot. Whatever the case, it's probably a lack of the romance of the great songs that makes this disc, on the whole, a little bleak. And while Müller-Brachmann is still a relatively young singer, the voice has developed gritty quality and slight lack of sensuality that nevertheless seems well suited to the world-weariness of the five songs we have from Op.89 – the settings of von der Neun – defined as many of them are by a certain sense of resignation. This resignation continues less in the song of that name (Op. 83 No.1 to an anonymous poem) than in the moving 'Einsiedler' – 'Schumann's farewell to Eichendorff', as Johnson describes it – and the deeply touching 'Mein altes Roß'. The Drei Gesänge Op.95 which follow set translations of Byron and are strangely and impractically designated for voice and piano or harp. The outer two songs bristle with energy and are performed here with plenty of gusto, impetuosity and vocal strength by Katherine Broderick. Four additional singers are employed for the 1849 Minnespiel Op.101, settings in solos, duets and quartets of poems by Rückert. Adrian Thompson is the sensitive tenor, entrusted with the best-known 'Mein schöner Stern! ', but the charming duet, 'Ich bin dein Baum' is also touchingly done by Stella Doufexis and Stephan Loges. Geraldine McGreevy completes a quartet who skilfully – in whichever configuration – capture the right sort of light sentimentality that informs the cycle. Then come the Reinick settings and although Schumann's skill is never in any doubt, there's a distinct lack of the magic which he so liberally sprinkled over his other 1840 songs, perhaps only the final 'Liebesbotschaft' shows the composer near to his best. They are all performed with complete commitment by Müller-Brachmann, though, and are enjoyable on their own terms, as are the two other songs from Des Sängers Fluch which follow. Cleverly Johnson programmes a wonderful Schiller setting, 'Der Handschuh' Op.87, to bring the disc to some sort of rousing conclusion. This release caps another great achievement by Johnson, whose playing is predictably a model of sensitivity and intelligence throughout. Although obviously not on the scale of Hyperion's groundbreaking Schubert edition, one could argue that Johnson's careful preparation and meticulous scholarship is even more important in the case of Schumann, whose achievements as a composer are far more problematic.